Lucky “Tom” of Delaware found his way to a $50,000 scratch-off win at an Elkton retailer. A former smoker who made a trip to the store to buy nicotine gum left with $50,000 worth of smoking hot riches, courtesy of the Maryland Lottery. 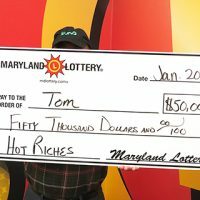 The lucky Delaware man, nicknamed “Tom,” won the $50,000 top prize on a $5 Hot Riches scratch-off. “Tom” collided with Lottery luck because he is using nicotine gum to help curb the urge to smoke. Realizing he had opened his last piece of gum, the Newark man hopped into his car and went to Bridge Street Liquors in Elkton to stock up on more gum. While in line, the 53-year-old saw Maryland Lottery scratch-offs by the register. Curious about the instant tickets, the former smoker bought his nicotine gum and added five Hot Riches scratch-offs to his purchase. “Tom’s” excitement was so great he couldn’t wait to scratch off the instant tickets! He started scratching the games while at the Cecil County store. One lucky instant ticket revealed a money bag symbol with the word “WIN” underneath it. Knowing he had a winning instant ticket was one thing, but when “Tom” realized the size of his prize, he rushed home to share the great news with his wife.